11:15 a.m. on a bright summer Tuesday morning. The Texas heat was already claiming victory as my friend and I slipped inside the doorway of Allo French Rotisserie, a new bistro in the Vintage Park shopping center, Louetta Road at Highway 249, just northwest of Houston. Vintage Park is an interesting phenomenon, one of those large, rambling shopping centers that is meant to resemble a Tuscan village. It’s part of a whopping 630-acre tract of land purchased from Hewlett-Packard in 2004/2005 and transformed into an upscale residential and mixed-use retail development known as The Vintage. The shopping center was completed in 2007, just in time to receive a punch in the stomach from the Great Recession. With only a fraction of its total square footage leased, the center limped along for a few years without significant growth. Whispers of a Nordstrom’s and other “star” anchor tenants came and went. But gradually, like the temperature on a Houston summer day, things at Vintage Park have heated up. Instead of big name tenants carrying the load, the center is now filled with local and Texas-owned shops and restaurants that are making their own buzz. With the current robust Houston economy and the ongoing population boom in northwest Harris County (Think “new Exxon headquarters” and “Grand Parkway extension.”), Vintage Park is a happening place. Austin-based Alamo Drafthouse Cinema is here, and a new Whole Foods Market and Torchy’s Tacos recently opened just down the street. Despite what some might consider the handicap of being located outside of Houston proper, fun and forward-thinking eateries and watering holes such as El Tiempo, Facon, Peli Peli (Click here for our Peli Peli post. ), and Brix Wine Cellar are pulling in the crowds, attracting patrons from all over. Destination restaurants in a distant suburban shopping center? [Gasp] Unheard of! The interior of Allo is Euro-sleek, yet comfortable and inviting. The restaurant is fast-casual–you order up front from the menu on the wall near the counter. After you’re seated, a server confirms your order and brings your drinks and food. The menu offers the popular classics of French bistro fame: pate, quiches, French onion soup, steak frite, escargot, a charcuterie and cheese plate, plus other items that dovetail well with these favorites, including a duck breast in Hoisin sauce, salmon and tilapia dishes, and pan-seared shrimp. We took our seats at the spiffy bar to watch the latest World Cup action. To start, I ordered an industrial size mug of cappuccino, not only because I was several hours late for my morning coffee fix (which is liable to put me into DEFCON 2 irritability mode), but because Allo has a full service coffee bar and uses Segafredo Zanetti espresso. In the evenings, the restaurant offers wine, cocktails and beer. 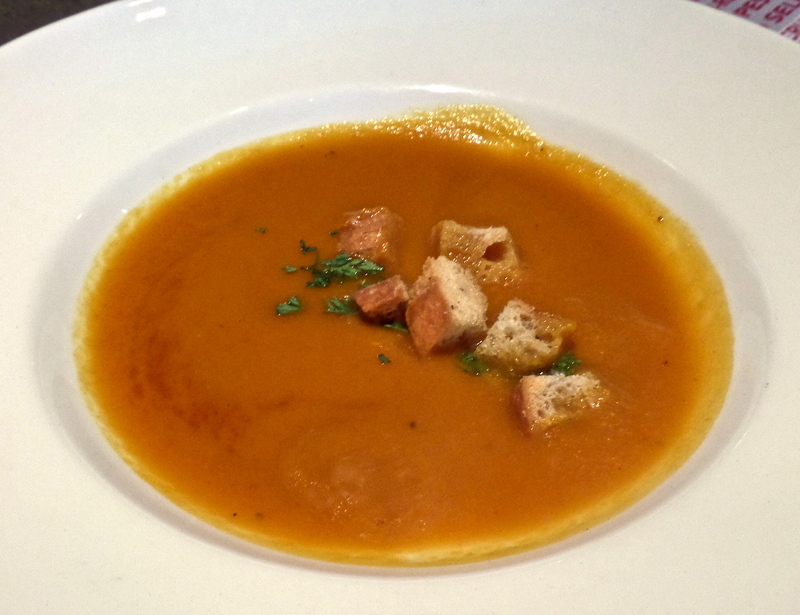 More of a traditionalist, my friend started with the soup of the day, which was carrot. The wide, shallow dish held a flavorful bronze puree, topped with a well-placed smattering of homemade croutons. I sampled a delicious spoonful. It was one of my fumbles while in Paris (Read our Paris Wine & Dine post.) that I never got around to ordering a Croque Monsieur, and at Allo I resolved to correct this error. The unofficial sandwich of Paris, a Croque Monsieur is a slice of French bread topped with cured ham, melted cheese (typically Gruyere or Emmental) and béchamel, all toasted together. 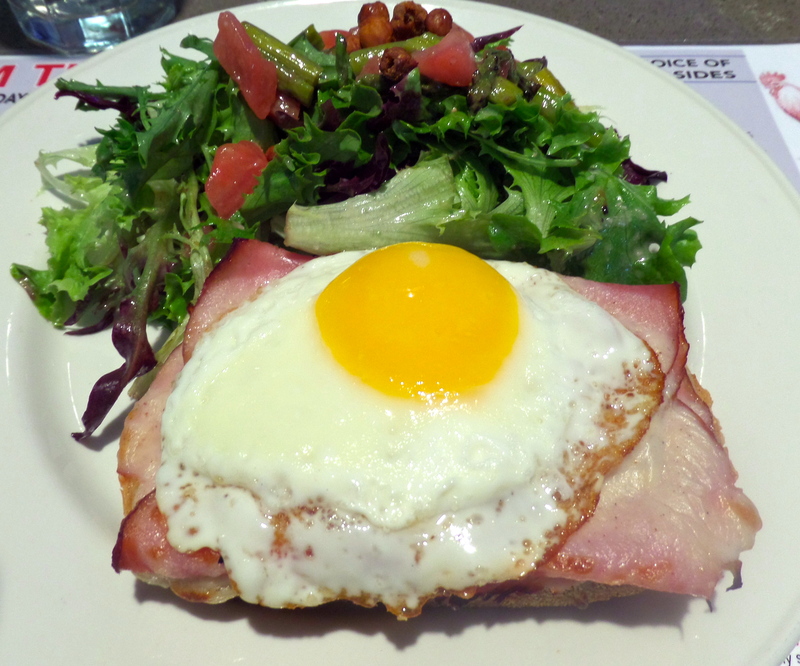 A Croque Madame is the same, only topped with an egg. As per the instructions of my go-to Paris food blogger, David Lebovitz, I made a strategic slice through the egg, allowing the yolk to trickle down the sides of the sandwich before digging in with knife and fork. The mixture of flavors and textures was very satisfying. I can’t imagine being served any better in France. 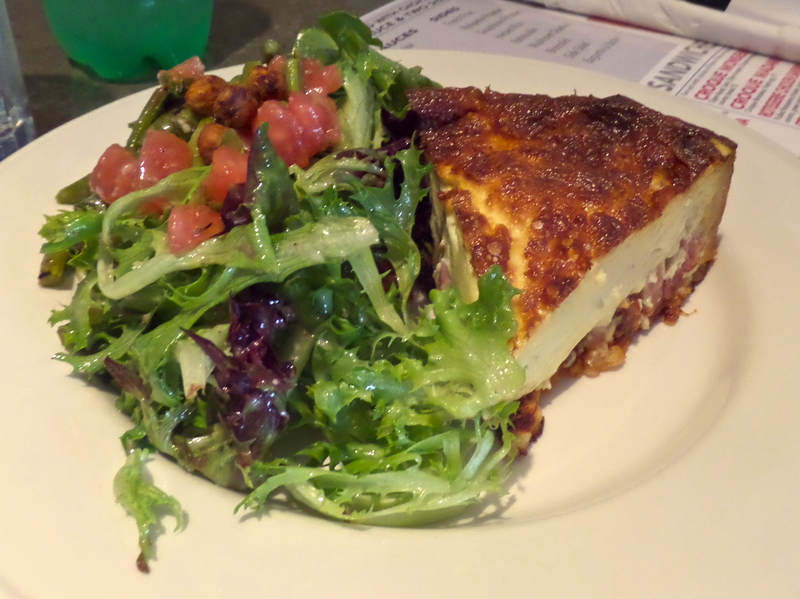 My friend’s order of a tall, fluffy wedge of quiche Lorraine came nestled against a jumble of fresh greens, diced tomato, crisp chick peas, and grilled asparagus tossed with a simple red wine vinaigrette. The heart of Allo’s menu is its roasted meats. Rotisserie chicken and herb-crusted sirloin are available every day, along with a “rotisserie of the day” offering. Tuesday’s special is short rib, which our server insisted we try. 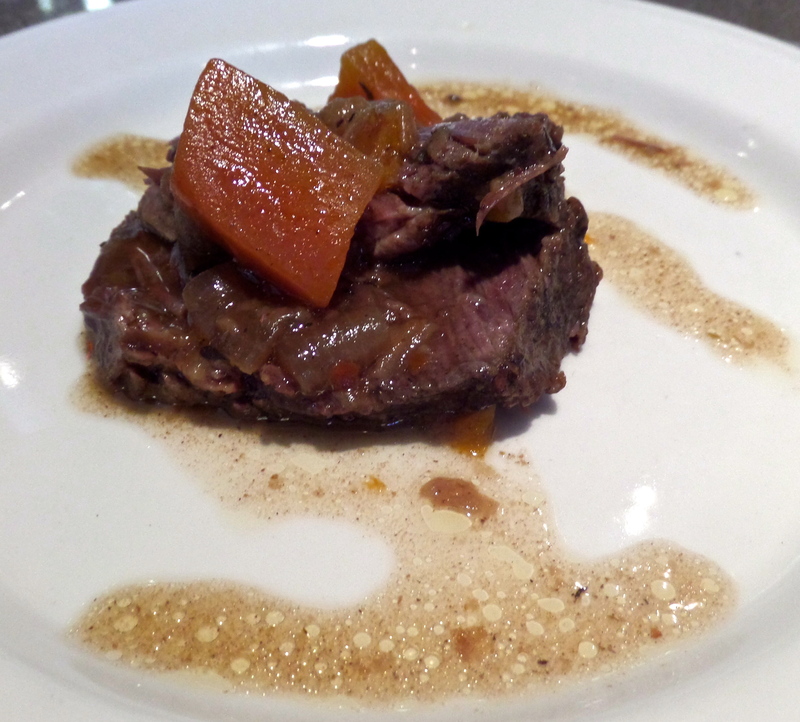 He brought us a small portion that was fall-apart tender and sweet from the carrots with which it was slow-cooked. Friday’s rotisserie is porcini-rubbed brisket which, according to our server, is so popular that the dish sells out by mid afternoon. 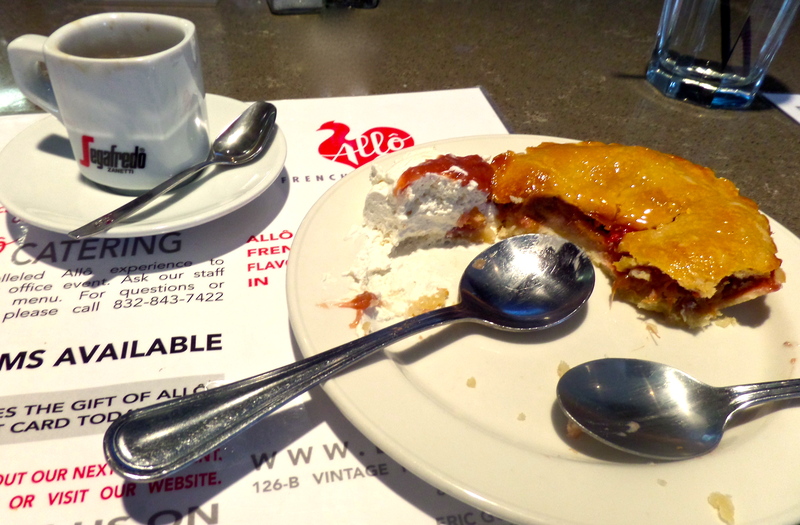 Greedy for another round of Allo’s coffee, we ended with espressos and a hearty, flavorful strawberry rhubarb tart, served with a large dollop of whipped cream. 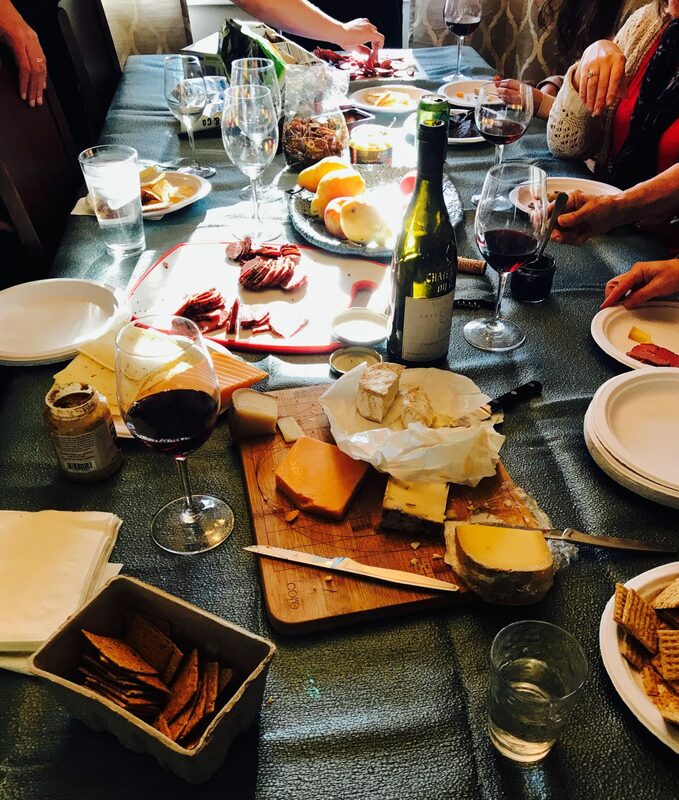 By the time we were finished, all the tables at Allo were full: Moms with their kids home for the summer, business lunchers, an extended family from Argentina. A meal at Allo reminds me of eating at some of the places that “Inner Loopers” sometimes think they have cornered the market on. Here’s a secret: Vintage Park was built by the same people who brought you the Uptown Park shopping center–you know, that uber upscale retail development just off Post Oak Boulevard near the Galleria. Allo feels like a no-fuss, streamlined version of the well-reviewed and very delicious Etoile, which is located in Uptown Park. All this, and a reasonably-priced menu that does not require Google Translate in order to read it–what’s not to love? 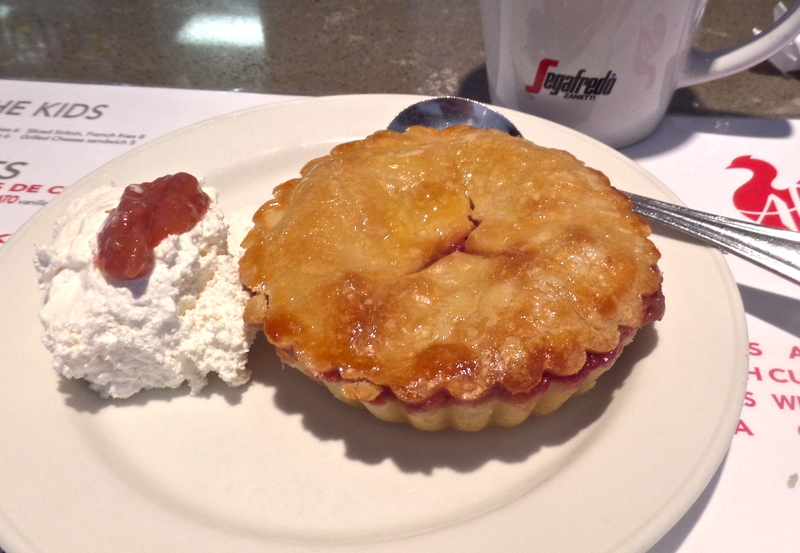 Is it possible that suburbanites can appreciate the pleasures of French-inspired bistro food? Is it possible to get such quality way outside The Loop?